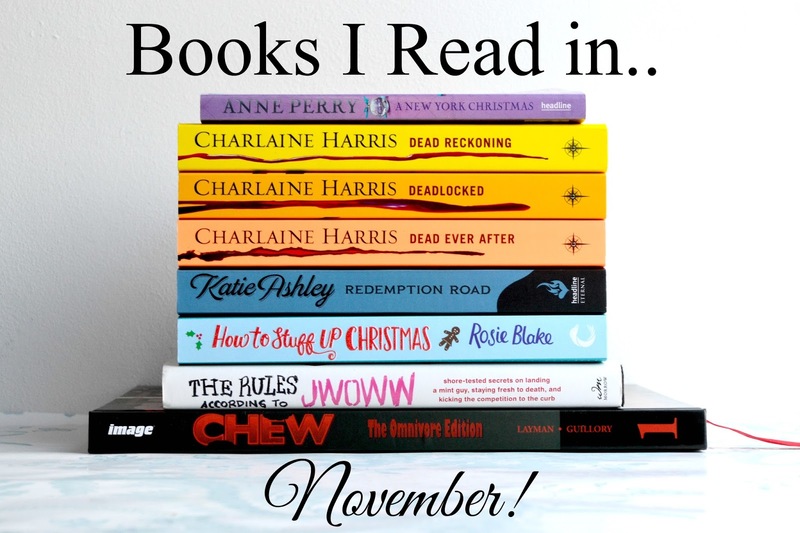 November seems to be the month of the female authors this year! Every novel I read was by a female author and only the one comic book, which didn't seem enough to do a separate Comic Books I Read in.. post, was written by a man. Although unintentional, this makes me quite happy. As does the number of books, quite a contrast from November 2014! I read this way back at the beginning of November as part of the Hallowreadathon, and flew through it in a day. But honestly, a month later, I can barely remember what happens. I enjoyed reading it while I was reading it, but as the series goes on, the plot lines blur and the books become less and less memorable. I just didn't click with this one, there's a lot of domestic happenings which I like- in moderation, which this lacked. I could see clearly where the series was going but, like Dead Reckoning, I struggle to remember any details of story or plot. I really need to write better notes while I read! This book is neon, which shows up horribly in bad lighting. It is also the final book in the Sookie Stackhouse series and I'm in shock. This is the first time in over a year that I'm not currently reading a Charlaine Harris series, I hope to remedy that soon. Either way, I wasn't as disappointed with this book as most people were. Maybe because I knew Harris's endgame, I knew who Sookie ended up with and knowing that possibly had an effect on the way I read the book. I did, however, think it could've been written with more emotion. I'm not sure quite how I feel, but I was a little confused by the sudden change in narrative. 12 books of first person then suddenly, first person and third person. Note to self: When you're not sure about the first book, don't let the blurb of the second hook you in. The dialogue was so unnatural in this book, I couldn't get past it. It was like the characters were trying to sound posh but it just came off wrong. And they just spoke so much about certain ideas about sexual assault and love that it really just came off as preaching to the reader, rather than conversation. Not only that but they kept repeating the same phrases. The thing is, I get it, because I do it when I'm writing. I think of something brilliant that fits perfectly and it sticks in my mind so by the end of a writing session, it's been used about fives times with varying success. But it feels like something that should have been picked up in the editing process, especially when they're repeated just a few pages or even paragraphs apart. I won't be reading the third book in the series, even though it's about the most interesting character from the first two. I'm afraid I just don't click with Katie Ashley's writing. Jwoww is my second favourite from the Jersey Shore cast, first being Snooki obviously. She's strong, she's tough, she takes no nonsense. She reminds me of my best Booboo, Ashley. So when I first read this book in my late teens, I soaked up the information and remember thinking to myself that I would re-read it in the future. I loved it, but I've matured. There's lots of talk about manipulation in relationships, some really awful opinions about men and women, and a questionable rule about not going home with a guy if you don't plan to sleep with him or you're 'asking for it'. Bleugh. Not acceptable. I enjoy her attitude, I liked the parts about self-respect, and I'm pretty sure the book would read differently if she wrote it today. But I won't be following a lot of her advice. If you're a Jersey Shore fan, you might want to pick it up. But Snooki's books are better. Chew is about a detective who knows the history of everything he eats. This was another read from the Hallowreadathon and it's a fun comic! A little gory, a little gross, and very intriguing. It's right up my alley. Unfortunately, it can be a little hard to follow at times but the art is great and it's a really original concept! *These books were sent to me for review. This has not changed my opinion. Labels: Book Review, Books, Books I read in…., Comic Book Review, Comic Books, Comic Books I read in….